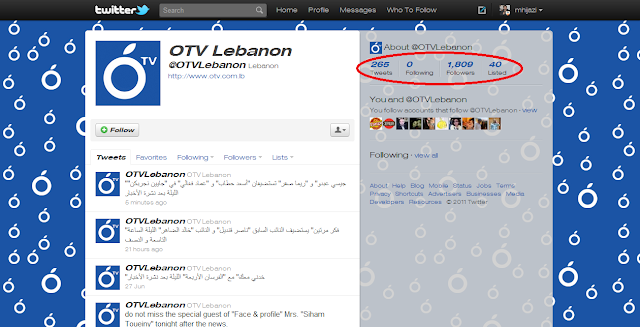 I just stumbled upon OTV's account on twitter. Not surprisingly, they fail at the first rule of social media: Social Media is an INTERACTION between a company and its customers (fans, followers, etc..), i.e. there should be TWO-WAY COMMUNICATION between the brand and the fans. If you check OTV's twitter account, they have almost 2000 followers but they are following ZERO people. If you look closely at their tweets, they are basically regurgitating news headlines in their tweets, no interaction, no responding to replies, no nothing. This totally beats the purpose of social media. If you think being on twitter will get you more viewers, then you are wrong. THE WHOLE POINT IS FOR YOU TO DIRECTLY INTERACT WITH YOUR FANS. By not following anyone, it not only shows you as an egocentric company who only cares about blasting your opinions to everyone, but you are also not creating any value for yourself or your customers. If you decide to go social, or if you are already online and your doing the same thing, I advise you to either do it right or get off social media. 2000 followers disagree with your statement. I don't really think there should be a certain rule to follow. I don't want to interact with the OTV staff, why would I want to? People just want to receive short timely updates from the broadcasting channel, and they provide that. @Jay, 2000 follower follow them not because they want their news, but to show their political affiliations. OTV and the other channels do not only broadcast news, their twitter accounts should reflect everything they do and not just a broadcast of news updates.